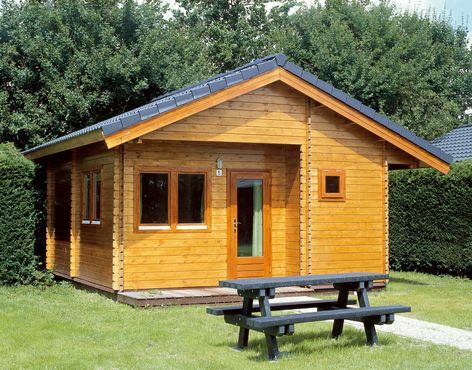 The Madrid log cabin features space inside for two bedrooms, bathroom and an open kitchen/living area. The built in canopy makes an attractive feature. Size approximately 5.5 x 6m in 44mm log thickness or optional 68mm. 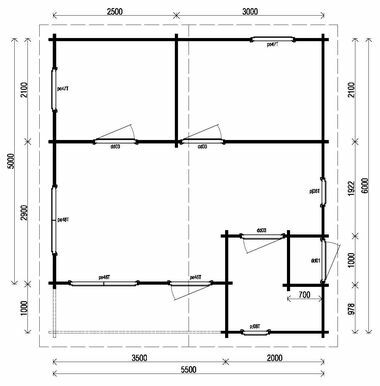 The standard package includes 2 double tilt & turn windows PE47, 2 toilet top hung windows PJ08, 1 single door PE47H, 3 solid panelled doors DD03 (opening right) and 1 solid door DD01. Door and windows are double glazed. The built in canopy measures approx 3.5m x 1m. Internal walls as per the diagram are included.